Home Mobile Android What is progressive disclosure UX ? What is progressive disclosure UX ? With user needs now at the core of product strategy, the latest challenge for designers is building digital experiences that reach a wider user base. But despite the surge in design tools that enable designers to create impressive interfaces with sophisticated interactions, designing right by different users can be tough. In order to keep your design process on track, remember what your goal is: to design interfaces that draw the user in. One way to do this is through progressive disclosure. This design pattern intends to reduce UI clutter, confusion and cognitive workload so that the user’s focus remains on the interface. In this post we will explore how progressive disclosure UX can help us to design interfaces that are simple, responsive and just what the user needs. What is progressive disclosure UX? Progressive disclosure UX is a technique and design pattern used in UX design to make user interfaces easier for users to interpret. It involves sequencing information and actions across several screens so as not to overwhelm the user with reams of content all in one go. Progressive disclosure UI examples include tooltips, labels, keyword shortcuts, expandable text and instructional overlay. Here’s an example of progressive disclosure in a mobile app walkthrough, made by Justinmind. Another type of progressive disclosure UX is staged disclosure. This is when users are shown a step-by-step guide in a linear fashion. A classic example of this is the wizard, a UI feature to help users complete an activity such as creating a new Justinmind prototype. Progressive disclosure UX can be a helpful way to guide your users through your interface. But it’s not always the answer. User research is an important aspect of the UX design process and will help you get to know your target users and understand which methods you should use to reach them. User personas: discover who your users are, what they do, what their objectives/frustrations are. Learn more about these techniques and how you can use them in your UX design process here. Speak with customer care or sales representatives as they have the most contact with users and can tell you what they ask for, and when they need it. Look at your metrics: what’s the most popular content? What are the most visited questions in your FAQs? Whatever the answer, this is the content that should be shown first. Test: as always, data can provide you with the answers to your hypothesis. Learn more about testing in your design process here. With Justinmind, you can easily use the progressive disclosure technique in your UX design process. Using the right combination of UI elements and interactive features will give your users the feedback they need to navigate your UI. Justinmind has a wide range of pixel-perfect UI widgets to choose from. 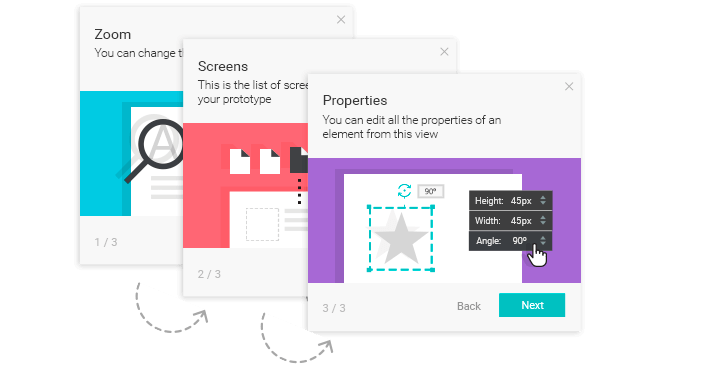 And its interactive features are what makes it a leading prototyping tool for web and mobile. So what are you waiting for? Download Justinmind now and start using progressive disclosure UX techniques in your prototypes now!